The next step after ITER will be a demonstration power plant—or DEMO—that will explore continuous or near-continuous (steady-state) operation. Decades of fusion research and generations of fusion devices have contributed to the design of ITER. And ITER, in its turn, will contribute to the design of the next-generation machine—DEMO—that will bring fusion research to the threshold of a prototype fusion reactor. The knowledge and the know-how garnered during the exploration of ITER's hot plasmas will be used to conceive the machine that will explore continuous or near-continuous (steady-state) operation and test the large-scale production of electrical power and tritium fuel self-sufficiency. The term DEMO describes more of a phase than a single machine. For the moment, different conceptual DEMO projects are under consideration by all of the Member nations participating in ITER and it's too early to say whether DEMO will be an international collaboration like ITER, or a series of national projects. But there is cohesion around the timeline for the DEMO phase of fusion research: planning, which is already underway, should continue throughout the early years of fusion operation in ITER to benefit from the return from ITER experiments. Construction is foreseen to start in the 2030s, and operation in the 2040s. 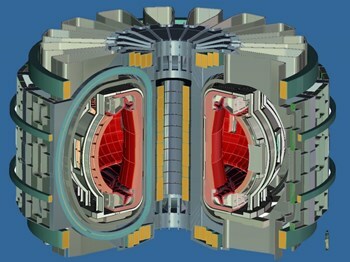 Korea's projected K-DEMO: a tokamak with a 6.65-metre major radius (as compared to ITER's 6.21 metres). DEMO is the machine that will address the technological questions of bringing fusion energy to the electricity grid. 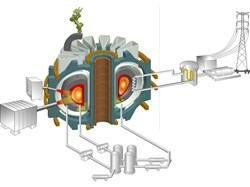 The principal goals for the DEMO phase of fusion research are the exploration of continuous or near-continuous (steady-state) operation, the investigation of efficient energy capture systems, the achievement of a power output in the Q-value range of 30 to 50 (as opposed to ITER's 10), and the in-vessel production of tritium (called tritium breeding). DEMO would be a simpler machine than ITER, with fewer diagnostics and a design more targeted to the capture of energy than to the exploration of plasma regimes. While ITER is under construction and DEMO is in its conceptual phase, other installations with diverse characteristics and objectives are planned to conduct complementary research and development in the areas of advanced material development, tritium self-sufficiency, and heat exhaustion. In Japan, for example, the engineering validation phase for the International Fusion Materials Irradiation Facility (IFMIF) program has begun. This installation, part of the Broader Approach Agreement (see below), will test and qualify the advanced materials needed for a full-scale fusion plant. 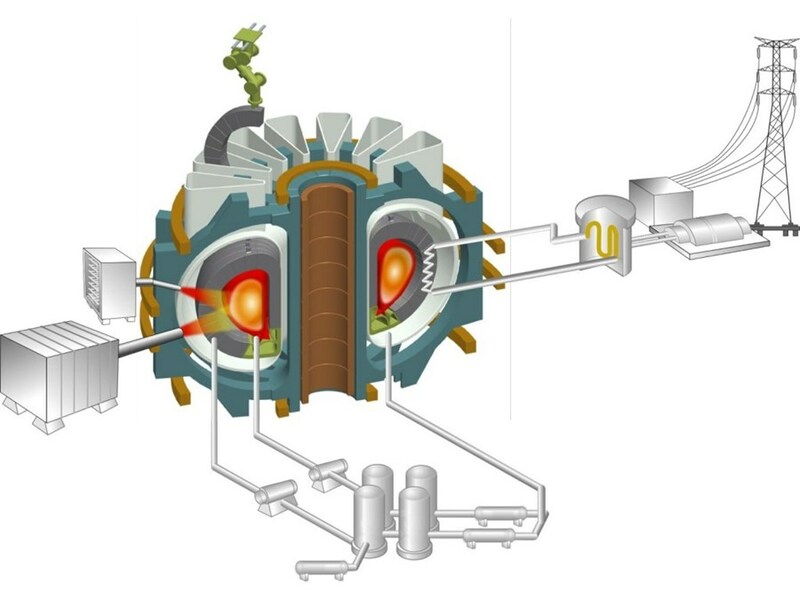 Beyond DEMO, the final step to producing fusion energy would be the construction of a prototype reactor, fully optimized to produce electricity competitively. The timescale for such a prototype depends heavily on political will to reach this stage, but most forecasts place this phase of fusion energy development at the middle of the century. In parallel to the ITER Agreement, which established the ITER Organization, an agreement for complementary research and development called the Broader Approach was reached between the European Atomic Energy Community (Euratom) and the Japanese government. Signed in February 2007, it established a framework for Japan to conduct research and development in support of ITER and the next-step device DEMO over a period of ten years. Within the Broader Approach three projects were set into motion: a materials testing facility, a fusion energy research centre for advanced plasma experimentation and simulation, and an upgrade of the JT-60 tokamak in Japan to an advanced superconducting tokamak in order to contribute to the development of operating scenarios for ITER and to address key physics issues. More on the Broader Approach here. 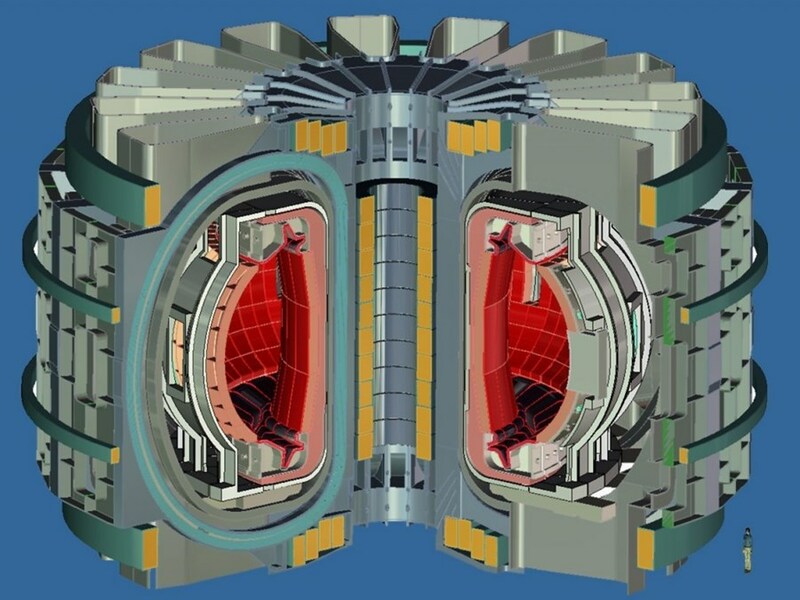 Looking ahead | "The world community around fusion is expanding"
ITER ... and then what?